Thanks to Tchaikovsky's "Dance of the Sugarplum Fairy" from "The Nutcracker," the other-worldly bell tones of the celesta have come to symbolize this time of year. Why is it that, starting in early November, practically every commercial on TV has to use some version of this song and those bells? When you first hear the music, it's peaceful and soothing. By the time December rolls around, you might be sick of it. No more sugarplum fairies selling cars, or kitchen gadgets,or computers. Fred Child, host of Performance Today, stops by to help us get this tune out of our heads and suggest some alternate uses of the celesta. John Moe: Tell me about the celesta. What is it? Child: Well, if you look at it, it looks kind of like a small, upright piano. There's a little wooden box. It has a keyboard on one side -- not as long as a piano keyboard, a little bit shorter. But on the inside, instead of hitting strings, the hammers hit these little steel plates. There's beautiful, high, clear, penetrating tones, and those vibrating steel plates are what make the sounds of the celesta. Moe: Help me get this song out of my head. This can't be all there is to the celesta. Child: A couple of decades after Tchaikovsky, Gustav Holst wrote a piece called "The Planets." Gustav Holst was not only a good composer, he was a really good astrologer, too. Actually when you listen to "The Planets," it's not about the planets out there in space. It's about the astrological ideas represented by the planets. Moe: It's about your horoscope? Child: Exactly right. He was reading a book about how to cast a horoscope when he wrote this music. Neptune was the furthest out of the planets. For this far away, celestial sound, which, by the way, is where the name comes from -- this other-worldly sound -- he used celesta. It's not doing much to carry the melody line is it? Child: No, it's really just a feeling. There's a great melody in "Dance of the Sugarplum Fairy," but the celesta is really about the feeling of creating an alternate reality. There's a very spritely quality to it too. It's an alternate reality that's kind of perky. Child: Alternate realities are sometimes very friendly and benevolent, but sometimes they are very evil and malevolent. Bela Bartok wrote a piece that has "celesta" in the title. It's called "Music for Strings, Percussion, and Celesta." Moe: Does it sound like composers all copy each other when they're writing for celesta? It's that same up and down� It's that trill up and down kind of thing. Child: And again, as you said, not melody. It's just creating a sense of that alternate reality. It's almost like the rules of physics change a little bit when you hear the celesta. Moe: I'm imagining some fairy dust being sprinkled every time I hear it. Moe: And that notion is being used in contemporary cinema as well. Child: Yes, and in fact that very moment we just heard shows up in several movies. It's in one of the hippest movies of all time, "Being John Malkovich." Moe: There's a child-like quality through a lot of it, but then there's an underscoring of peril and danger, which brings us to the Harry Potter movies. Child: John Williams, when he was writing the music for "Harry Potter," used the celesta. Again, it has that child-like sense of wonder and that undertone of malevolence. Moe: Sounds like snow falling. Harry's in a world of wonder, but Voldemort is going to try to kill him. Child: There are quidditch games to come, which could be a lot of fun but could be really dangerous, too. Moe: There will be hijinks and shenanigans, but also evil, too. Moe: We've talked about classical composers. We've talked about film scores. The celesta is a compelling instrument, but it's never going to replace the piano or the guitar. Is it being used in popular music today? Child: Even though the sound [of the celesta] comes from metal -- that vibrating steel -- I don't think we'll hear Metallica using it anytime soon. Child: It's not a real powerful sound -- the celesta. But lots of other folks have discovered this. You hear lots of celesta in people like Bjork, Sigur Ros -- bands and artists that specialize in that other-worldly sound. The Eels is a band that loves to use celesta. It's all over their albums. It's also on a song by the band Death Cab for Cutie. It's a song called "Title and Registration." Child: Absolutely. Man, that rocks! John, there's one more song I want to share. It's a classic piece of American music that's so well known, but I don't think people make the celesta connection when they hear this. The song is "Everyday" by Buddy Holly. Moe: Fred Child is the host of Performance Today from American Public Media. Thanks Fred. Child: Glad to be with you John. I know ya'll are done now, but the celesta has continued to haunt me. I think it's in the theme music for Skins, a british tv show and Dollhouse, a new show on Fox. Am I crazy? Maybe it's just Celesta like. The preferred pronunciation of the "cel" in "celesta" is like that of cellar or celestial. 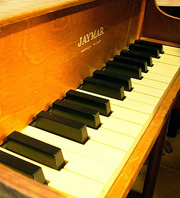 The "che" pronunciation exists, but does not make much sense, since the celesta is based on the French "célesta", from "céleste", meaning "celestial". A pity you didn't mention that it invented in France. But otherwise, I very much enjoyed this piece. The song that came to my mind while listening to this segment was "Cosy in the Rocket" by Psapp--most people know it as the theme song to the TV drama, "Grey's Anatomy". The celesta merges with electronically-produced sounds to create pinging noises that almost make you feel like you are in an actual operating room. In college, I was going through a Buddy Holly phase and was playing his stuff in my office all of the time. One day, someone came into my office when "Everyday" was playing and said "Why are you listening to Christmas music in May?" I stopped playing Buddy Holly music in my office after that! The celesta on "Everyday" was played by Vi Petty, the wife of Norman Petty. I think it was Norman Petty's idea. I've seen video of her playing it on a special on Buddy Holly. It was in the studio because Petty managed a number of non-rock acts. Loved the story on the celesta. One very obvious example of its use is in Ferde Grofe's "Grand Canyon Suite." If you want to hear it, pop in your DVD copy of "A Christmas Story" (that now cult classic with Ralphie and Randy) and cue it up to about 1:13:45. It's a wonderful little passage from Grofe's orchestral portrait and perfectly captures the glistening mantle of sparkling snow on a Christmas morning. I have always loved the sound of the Celesta without knowing what it was. I always reminded me of what popping champagne bubbles should sound like. Thanks for bit of information that should help me track down more music to listen to. I loved this story! I took for granted that the sound in Buddy Holly's "Everyday" (one of my all-time favorite songs) came from a xylophone. I am a big Harry Potter fan, as well, and will always think of this story during the movies' credits. My Saturdays are very often spent getting caught up around the house, and Weekend America is the high-point of my afternoon NPR listening! Wonderful: One of those sounds that every time you hear it you wonder how they made it. I have watched symphonies trying to figure if it was bells or triangle. Now I now about the Celesta. I love Tchaikovsky and Buddy Holly and am surprised an instrument has entertained through centuries and not just decades. Thank you as I spend my Saturdays with NPR weekends and never fail to learn, laugh and be entertained.